Look at those juicy red strawberries! They tasted as delicious as they looked, and it was hard not to eat them all before I started making this divine pudding. But it was the prospect of the finished result that helped me resist temptation – the anticipation of a mouthful of strawberry eton mess parfait. If you want to impress someone, make this pudding. Hull the strawberries and then chop them into 1-2 cm chunks and set aside. Pour the double cream into a large bowl and whisk until stiff, then carefully fold in the yoghurt. Add the strawberries then crumble the meringues into the mixture so you get meringue pieces of varying sizes from tiny crumby bits to healthy, crunchy chunks. Now carefully stir everything together so it’s all combined. Finally, you need to add the lemon curd. It’s very important to remember that the lemon curd is there to run through the parfait – like a lemon ripple – not as a part of the main mixture. If you stir the lemon curd in too much it will change the flavour of the parfait completely and overpower the strawberries. So, make sure the lemon curd is at room temperature so it’s soft. If it needs softening a bit more, put it in a small bowl and warm it up beating it gently with a spoon. When it’s ready, carefully swirl the curd through the mixture with a metal spoon. This should be done in one movement for each tablespoon and no more. You can make individual portions, which make a lovely dessert after a special dinner, or you can make one big parfait if you want to make a real impression. For the individual portions, line small ramekins with cling film, making sure you leave plenty hanging over the edges and then fill each to the top and freeze for a minimum of 3 hours. To serve, remove from the freezer 20 minutes before serving. Use the cling film edges to remove the portions from the ramekins and place flat side down on a serving plate, garnish with strawberries and raspberries and dust with icing sugar. For a large parfait, transfer all the mixture into a cling film-lined loaf tin. If you use a silicon tin you won’t need the cling film, and you will get a smooth finish. This will need to be frozen for 5 hours minimum. 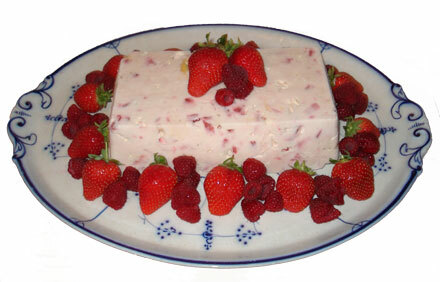 Remove from the freezer 1 hour before you serve it, garnish with strawberries and raspberries and dust with icing sugar. This is what chilly sundays are all about. Warm, comforting roast dinners, lovingly made as a reward for getting through the week, and bolstering you for the week to come. The meal featured here combines my and Mr Rice’s favourite sunday lunch elements, plus a surprisingly delicious new dish. You are currently browsing the She likes her food blog archives for October, 2007.